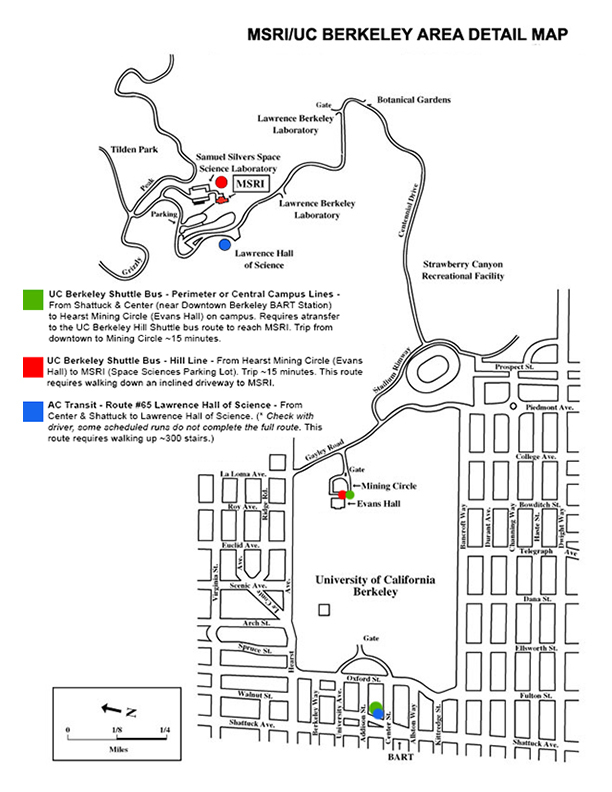 UC Berkeley has a shuttle bus that makes it easy to get up the hill to MSRI from the Berkeley campus. The Hill Shuttle ("H" line) runs Monday-Friday between 8 a.m. and 7:15 p.m. (excluding most holidays) between the Mining Circle / Evans Hall and MSRI. MSRI or UC Berkeley campus ID is required to ride for free; other passengers must pay $1 (exact change required). From Downtown Berkeley BART, a transfer from the Perimeter Shuttle ("P" line) or Central Campus Shuttle ("C" line) is required. Bus travel time from Berkeley BART to MSRI is typically 30-45 minutes, and can be more during the middle of the day. The shuttle schedules change from time to time, and the bus does not run on weekends and UC Berkeley holidays. On Saturday, Sunday and holidays you can use the AC transit service, bus #65 between Berkeley BART and Lawrence Hall of Science via Euclid Ave. and Grizzly Peak Blvd. (Be aware that some #65 buses do not travel to Lawrence Hall of Science; check bus signs or speak with the driver.) There is an hourly service Saturday and Sunday, and a half hour service weekdays (Eastbound from Bart to MSRI, and Westbound from MSRI to Bart). Note: the #65 bus drops off at Lawrence Hall of Science; you will need to walk up ~300 stairs to reach MSRI.